Click here to purchaseComplete Construction Plans Now Available! The Tiny Project house is built on a heavy-duty 8×20 foot trailer (with 3 feet added to the back for the porch). The house features 10 windows (including several large, south-facing windows, for passive solar gain) and an all-glass door. I took a no-compromise approach to opening up the small interior space to the outdoors, to feel less claustrophobic and more connected to my surroundings. The house will have fold-up roof overhangs to shade windows from mid-day summer sun, and will also include a fold-down deck. The house was designed with SketchUp. These renderings represent design of the house quite well, but to get an even better idea of what the house looks like, please browse photo gallery and the blog. Every step of the process has be documented. Tiny house construction plans are also available to build a house of your own to the same specs as the house featured on this site. Use of sustainably sourced items and efficient use of materials to minimize construction impact. Get the PlansOur Tiny House Plans Now Available! 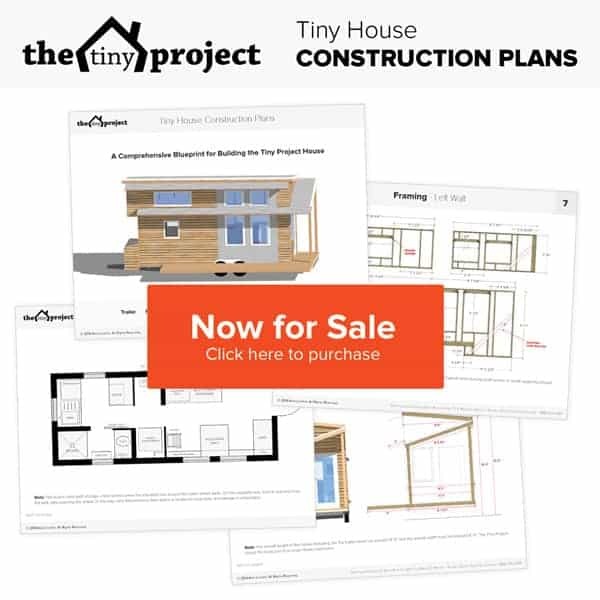 Tiny Project Construction Plans Now Available for Sale! We’re excited that we are now able to offer complete construction plans for the Tiny Project house! Plans include almost 40 pages of detailed diagrams and images, allowing you to build to the same specifications as the original Tiny Project house.